Hi everybody! Thank you for your comments and emails about my extended absence, I feel really special that people even noticed I was missing! I spent about a week and a half visiting with my parents and some cousins in North Carolina with my ever-faithful traveling companion, Corky. But, we're back home now. I have about 600 pictures to sort through and will return to regular posting within the next few days to show you the many foodie adventures of the trip (and a few touristy things too). I missed you guys and have tons of catching up to do! I feel so out of the loop now! Horchata, pronounced or-cha-ta, is a traditional Mexican drink made with ground rice. It has a cool, milky, white texture with a sweet side and a burst of cinnamon. Because of the spicy and firey flavors of Mexican food, it's a popular choice to soothe your tongue. Spain also makes an horchata, but I believe it's with ground nuts. I saw Andrew Zimmern try it once on Bizarre Foods and he said it was disgusting, so I'll stick with the rice version! I never had horchata, or even heard of it, before moving in with Johnny. His ex-wife was Mexican and her culture introduced him to it, and now he can't order Mexican food out without getting horchata. I tried a sip of his once, and while it's a bit of a surprise at first, you really will fall in love with it. Sometimes we order from our favorite Mexican place not for the food, but to have an excuse to get large, milky glasses of horchata!! Down in the basement I found an old cookbook, presumably from Johnny's married life, entitled Mexican Cooking for Dummies. I made horchata from their recipe once before, but it was very pricey. It used 1 quart of milk and 4 cinnamon sticks for only 3 quarts of drink. In the latest issue of Food Network magazine, chef Aaron Sanchez shares his recipe for horchata and I saw it was entirely different than the Dummies recipe, so decided to give it a go so we could compare. Stir the horchata well before serving. Pour into ice-filled glasses; garnish with a dusting of ground cinnamon if wanted. Preparation-wise the Dummies recipe blows this one out of the water. Nutrition and price-wise I prefer the Sanchez recipe. Both have pretty great tastes, but I kind of prefer the lighter, crisper version of Sanchez', versus the thicker, milkier Dummies one. Having made, and tasted, both of these recipes I'm going to combine the positives of both in the future. The Dummies version has you grind the dry rice on it's own until it's a fine powder, then mix with the liquids and let it sit. This was easier than all of that soaking and blending time. The Sanchez version uses only one pricey cinammon stick and saves you the extra fat, calories, and cost of using a full quart of milk. So, in the future I'll grind the rice and cinnamon stick first, let soak, and then discard the sediments - no blending, no milk, no extra cinnamon sticks. If you're not ready to jump into making horchata at home, I highly recommend ordering it the next time you go out to get Mexican or buying a carton (usually sold by the soy milk) to try it! You'll be surprised! It was a beautiful 80° day and I just couldn't bear the thought of being chained inside. 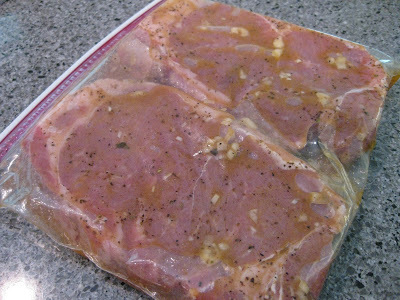 I thawed two loin steaks, totaling 1.2 pounds to grill on the Weber. Then I got to thinking, why not take advantage of those hot coals and cook everything out there?! No dishes and no kitchen clean up = SCORE!!! I cut up 1 zucchinni, 1 yellow squash, and the remaining asparagus from the quinoa salad - about 2/3 of the bunch. I layed these in a pyrex dish and poured Drew's all natural garlic Italian dressing over them, flipping and rolling them around to ensure everything was covered. I really like the integrity of Drew's salad dressings, but the flavor of this one is just too mild on a salad, so I use it for a marinade quite often. Next, I took a quart sized Ziploc bag and added 2 cloves of minced garlic, a big glug of Drew's dressing, and 1/4 tsp of black pepper and Old Bay seasoning. I smushed this around some to mix the flavors, and then threw the two steaks in, squeezed out the air, and made sure the meat was covered in the mixture. Everything went into the refrigerator to marinate for about 3 hours. While the coals were heating up, I took the food out of the fridge to cool down. I found a great site, GrillingTimes.com that lists thickness, cuts, times, and temperatures for grilling meats, seafoods, poultry, and vegetables. Because they take longer, I started with the asparagus, about 10 minutes total. Then, following their instructions for our 1" thick steaks, we cooked for about 3-4 minutes each side, turning 1/4 to get beautiful grill marks! This delivered a really juicy, flavorful, medium rare steak. 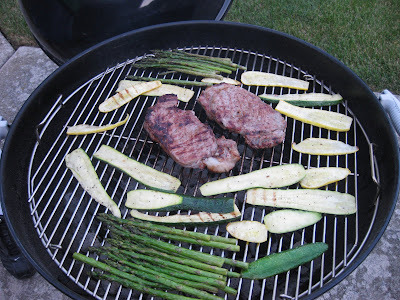 When there were about 5 minutes left on the steak, I threw the squash on because I cut them really thin, maybe 1/8". Everything came out absolutely delicious! The vegetables had a nice char flavor, but still a little bit of a bite, which I like. The steak was a nice medium with little bits of color here and there, which always has a nice burst of flavor! I received a little Leah & Perrins sample of the new thick worcestershire sauce, so decided to give it a head-to-head "taste-off" against our usual favorite A.1.! While the worcestershire was definitely really tasty, both Johnny and I preferred the A.1. for our steaks. 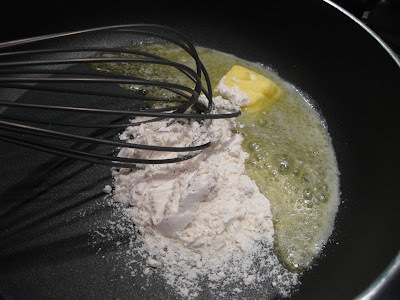 The worcestershire had a bit more sweetness to it, which I think would pair better with poultry, and Johnny said he'd like to try on a burger. After dinner the coals were still hot, so we did what every respectable American should do - made s'mores!! Here's a shadowy shot of me eating mine while enjoying Top Chef: Masters! And, the best part about dinner (besides no clean-up) is I'm still chipping away at my Freezer Meat Challenge! It's taking a little longer than I expected to make a huge dent. We've had some leftovers to use up, and then a busy week that lead us to eat take-out once and had friends over so I didn't cook! But I'm still holding strong, and even if I haven't used much I've remained true to my word and haven't bought anything to add to the load. Tonight's Freezer Meat Challenge dinner used up half of the home-made Italian sausage that my dad made from our freezer. I believe it was one pound and it came from the downstair's overflow freezer. My dad used to work for a butcher and the owner taught him the secrets and spice ratios to make sweet Italian link sausage, hot Italian link sausage, and ground breakfast sausage. Over the years he's experimented on his own and with my brother to come up with a few versions of their own. Tonight's was a Cajun link sausage that has an almost sweet heat and flecks of bright green from jalepenos inside the meat mixture. A few times a year they make a couple hundred pounds of natural casing sausage using a huge metal tub that my maternal grandfather used to receive baths in, an antique hand-cranked sausage press, and a vintage butcher's scale to weigh and package them. People flock to the door to pick up their orders, which are neatly labeled and lined up in coolers for them. More often than not, it's frozen in smaller batches and used for the next few months, until the next sausage making marathon when they can stock up again. First, I put a big pot of salted water on to boil for the pasta. While that was coming up to temperature, I browned the sausage links in a hot skillet with a little bit of olive oil, for 2 or 3 minutes each side, until they had a nice color. Then, I poured about 1/2 cup of water into the pan and put a lid on it, so they could begin to cook through. By now, maybe 5 minutes later, the pasta water had begun to boil. I threw the pasta in, flipped the sausages, added another 1/2 cup of water, and the sliced peppers and onions, and returned the lid. When the pasta had about 7 minutes left, I removed the lid from the sausage pan and let the liquid evaporate, and the sausage and vegetables get some nice color. I drained the pasta, and tossed it with a little bit of olive oil. To plate I first scooped pasta on to the plate, then added the sausage, peppers and onions, and finished with a sprinkling of shredded mozzarella over top. This was really fulfilling and I enjoyed the sweet heat of the sausage paired with the tender vegetables and soft pasta. The best parts are that it cooked in the time it took my water to boil and pasta to cook and dirtied only one pan! This made tons, too! We have a big tupperware container full of leftovers - enough for a whole second dinner! It'd feed a family of four easily! I'm horrible at remembering to thaw meat for dinner. I'll pick up a package here or there each grocery trip simply because I can't remember what I have in the freezer. The other day a freezer shelf fell and I had to take a bunch of stuff out so Johnny could put it back up and it lit a fire under me to see what is really in there! I looked in both our kitchen freezer and downstair's overflow freezer and made a list of all the meat sources I have on hand that I need to use up. 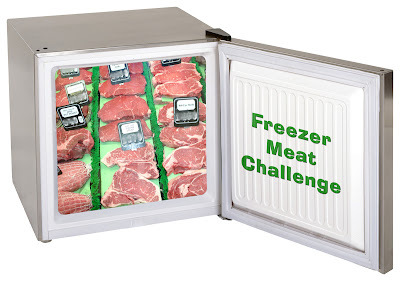 I'm going to hold myself to a Freezer Meat Challenge! I will not purchase any new meats until I use up this list and I hope I don't let it get to this point again, unless there's a big sale! I'll update each meat with a link to the recipe I used it in, until each item has been utilized! If you'd like to join my Freezer Meat Challenge, leave a comment below, or email christina at dinneratchristinas dot com and I'll link back to you! Just post a list of all the meats you currently have in your freezer and plans or goals for using them up. It'll be a great way to share ideas for utilizing those meat sources found within the frozen depths of freezers everywhere! 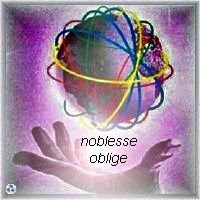 If you're going to participate, feel free to grab my challenge button, that Johnny so nicely made for me in about 5 minutes!